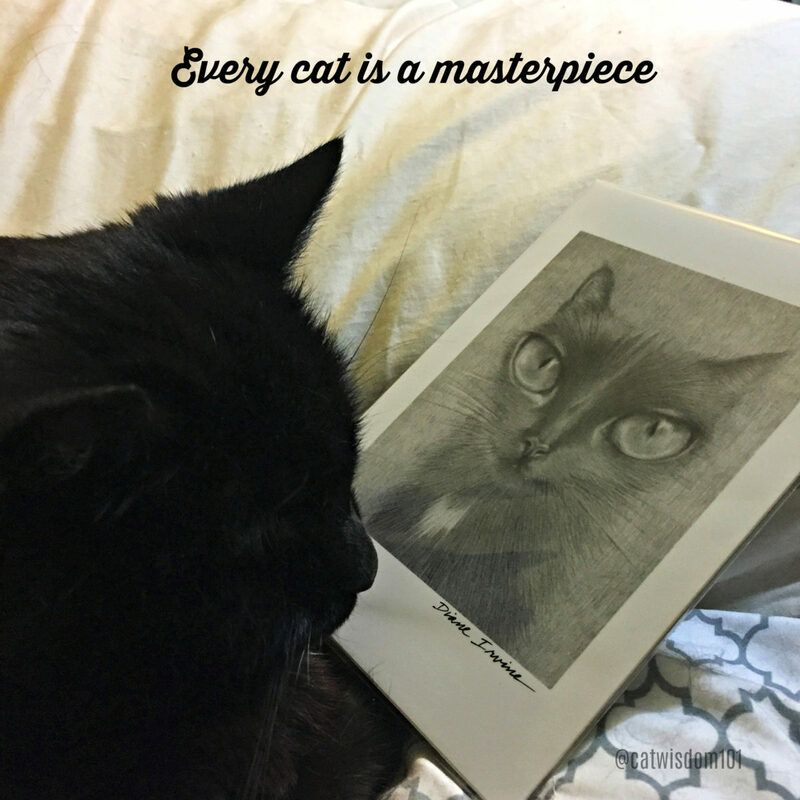 We’re making it easy to enter our cat art giveaway. Be a subscriber and leave a comment. For details about the bonus prize, scroll down. 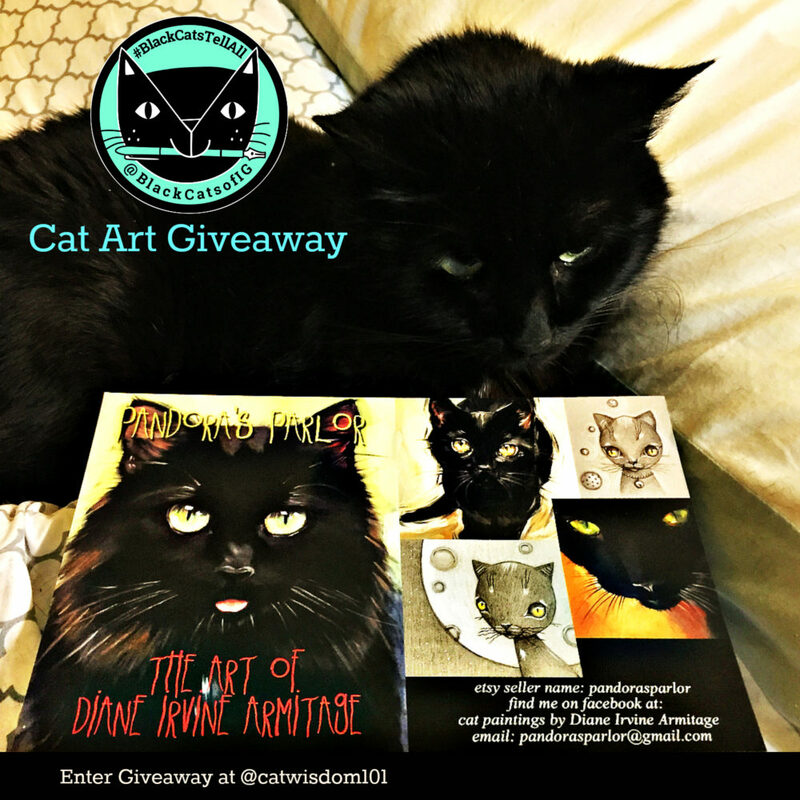 The cat art giveaway is open internationally and ends 11:59 pm Sunday, Aug. 13, 2017. This giveaway is not sponsored but FTC rules require disclaimers. We received art work and catnip which did not influence our views (well maybe a feline’s). Sharing would be extra helpful this week. We’ll announce the winner next week. I’m talking to you. And to this gorgeous creature and truth be told, I think I’m gorgeous too. Art does that ya know. It makes life more beautiful and bearable. Don’t fret darlings if you didn’t win. We have another giveaway from the amazing Diane Irvine Armitage, but first I want to share a little secret. We can all agree what a great job Mi-Ha did with my portrait BUT what I didn’t mention is just how young our talented portrait artist is. I’m 17 and older than her. Layla was surprised given her professionalism and brilliant communications skills that Mi-Ha is still a student. They’ve kept in touch on Instagram and both the artist and the winner have all been communicating about which cat to paint and a spontaneous mentoring is blossoming. Art and cat lovers seem to bring out the best in us. So, if you still want to see you furbaby immortalized in an original watercolor for a bargain, like $25 message Mi-Ha on Instagram @amber_blackberry. Her new Etsy shop is open. 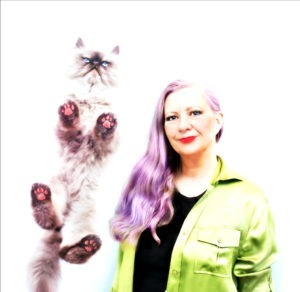 Which brings us full circle to another artist, Diane Irvine Armitage, a gifted and seasoned professional who specializes in cats. Life has a way of sprinkling gifts when good vibes and kindness are shared. And I just had to share about the last image in our book. Our fab designer, Jennifer Markley @antonioandfrankie asked Layla if she wanted to add a photo on the author page and she balked. There already is a small one in the intro and who needs another photo of a human when there could be more cats? Then, like magic, Layla spots a drawing on Instagram at @Pandorasparlor and shares it with her designer who says, “That reminds me of you and Clyde.” I had to admit it did capture our magical relationship and whimsical nature. The artist was none other than Diane Irvine Armitage who painted the amazing portrait of Cole of Cole and Marmalade and is the first cat featured in the book. You can see the painting in their testimonial video in our sidebar. It was a last minute decision to add the portrait and really last minute to get permission to publish the drawing. It turned out to be the perfect way to end the book. You won’t know how perfect until you read my story in the book. See that little eye necklace? It’s a clue. But wait, there’s more! It’s been a mad house finally getting the final, final, final version of the PDF uploaded to Amazon. The print proof arrives tomorrow. The review flipbook was completed yesterday and on Saturday, a box arrived from Diane. 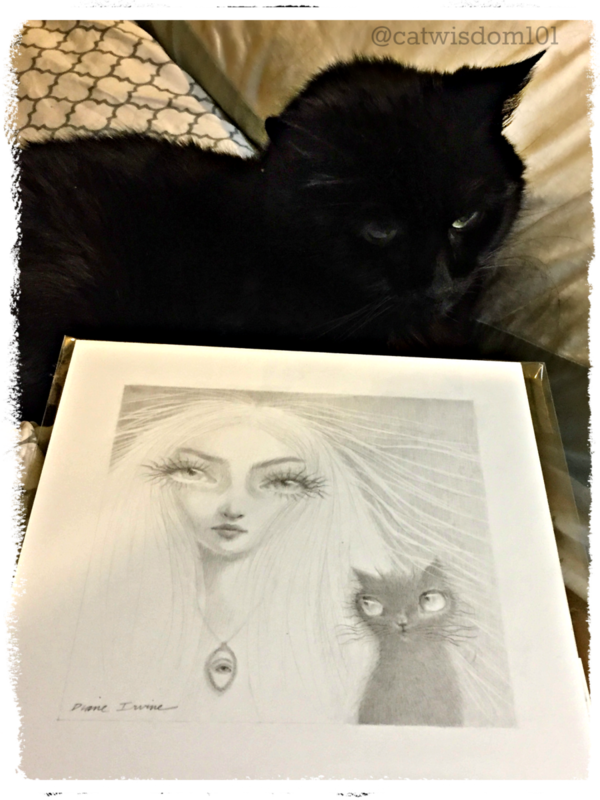 A few gorgeous prints of her latest exquisite cat drawings from Pandora’s Parlor Etsy shop including the drawing in the book. Happy dance of gratitude. Layla goes on working in a whirling Dervish frenzy and misses the letter. Much later, Layla takes a closer look at the prints and marvels at the fine details of the pencil drawing and squints, THAT’S NOT A PRINT! It’s the original drawing. No wonder it was packaged with extra care. The brain foggy blonde rummages in the box and finds a letter from Diane confirming the obvious and thanking her for helping cats. Hello, what about me? I’m a cat who helps cats. Okay, Layla maybe helps cats a little more than me. But what can say: catnip, cat nap, executive privilege. You can help cats too by buying our book. We will have a link up everywhere this week and will update this post. You can also win a very special giveaway prize. Layla will personally pack up a couple of Diane’s prints, a surprise gift, and a bag of the best catnip that you cannot buy anywhere. It’s from a small catnip farm and donated. Seriously, we have tested every kind of catnip over the years and lucked out when Picardo sent us some from Picardo of Palm Beach Island and Palm Beach Island Cats the awesome TNVR program for the 550 homeless cats living and working on Palm Beach Island, FL. Bonus gift: We’ll also send you a digital copy of our Black Cats Tell All book. Thanks for entering our giveaway and good luck! And Happy International Cat Day on August 8! P.S. I’ll have vet news next week and maybe something from my lazy fursibs. If you love black cat art as much as I do, you’ll love this selection. Diane painted 100 portraits last year! She is not currently available for commissions but do snap up a print if you can. What a wonderful tribute to all our Black Beauties! I would really appreciate the book and so would my little black man, Quasar. This looks like a gorgeous book of feline art. I would love to win this. We are sooooooooooooooooo excited waiting on the book to finally come out!!!!!!! We absolutely adore Diane’s work! She definitely has the soul of a cat fur sure since she captures them so well in the art. One must possess CAT in ones’ DNA to commune in any manner with them you know. We hope that everyone is doing well these days! We would love to win one of Diane’s beautiful and spiritual art works. Concats to Jennifer on winning the other giveaway!!!! Unique styles ! Me do love them. Paw up for the artists ! Gorgeous artwork that makes black kitties shine so brightly. It makes me miss terribly all the black-furred gems we’ve had over the years: Guardape (pronounced Guard-a-pea and he was named after my dad’s coworker at the time); Sammy D, who was a really cool cat who could usually be found hanging over my arm or in my lap; Spud who was extra-special for a whole lot of reasons; Bobo, short for Bocephus (so named because he came into our family the night my mom and youngest sister went to see Hank “Bocephus” Williams, Jr. in concert); and my Pudi who had a terrible attitude towards everyone but me and her sister Brows, my beloved Tortie. There were others in the mix over the years. Amazing artwork. This is art all cat lovers will really appreciate. Thanks so much. Absolutely beautiful art – art all cat lovers will appreciate. Thanks so much. Such great art! So many amazing artists! Diane is one of the most gifted artists around! What gorgeous artwork! I’m glad the book is finally just a fur strand away from being completely finished! I adore anything cats. I would love a copy of the book, it would mean so much . Clyde you are beautiful. Tell Odin to tell Mr Magical hello when he visits the garden. Of course I am a subscriber. @Pandorasparlor rocks- just followed, I am mesmerized. 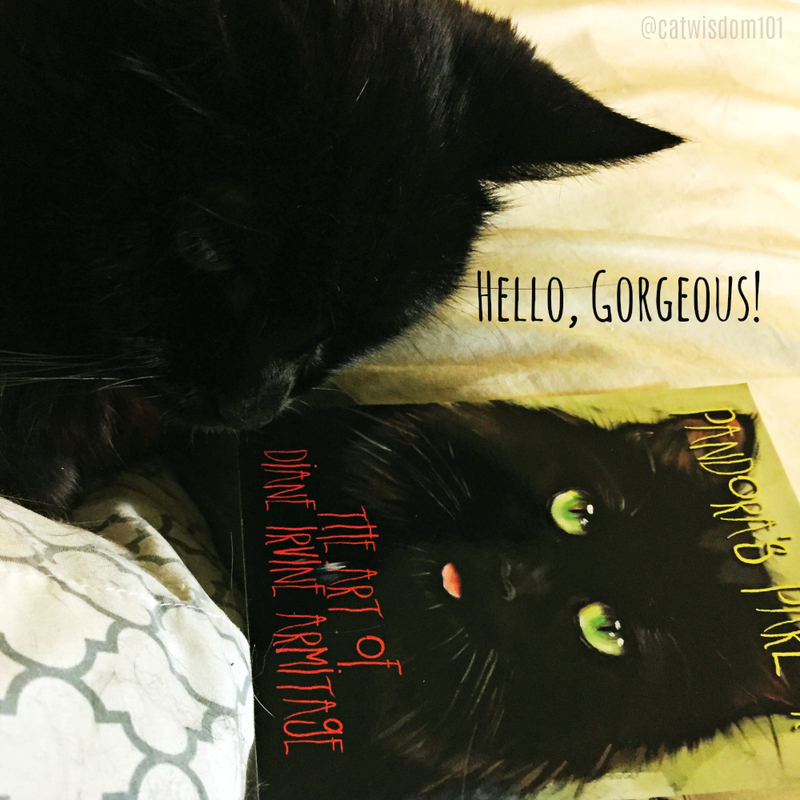 Black Cats Tell All is the book we sponsored – right? Different to this gorgeous black cat one? Wow Black Cats are in the ascendant and with pictures like that I am NOT surprised! Wow!!! Wow, Diane’s artwork is fantastic! Wow, Mi-Ha is a very young artist! I kinda wanted to become an artist when I was young but I didn’t pursue. She is very talented! Works by Diane are gorgeous, too! Diane’s work is out of this world. Whoever wins will be the luckiest person ever ? You can tell when the artist knows and loves cats! Beautiful work. Absolutely gorgeous! And I love the kindness that infuses it all *hufs* and purrs from Toby and myself. Beautiful art work. So much talent! ? Thanks for the giveaway. Beautiful prints. Such a great giveaway! We’re so excited to help get the book done. Lots of cat supervision of our human while working on this project from watching the monitor to walking across the keyboard to helping with the hard copy proofing-all cat approved! Tony, Frankie, Anastasia, Nicholina and Patrick. I love seeing different Artists works and how they interpret cats. Each one has their own unique style that is so amazing to see. It is very generous of them to do these giveaways. WOW! When the giveaway link is up, I’ll enter for sure! Thanks! When will those who donated long ago get the book? Those are amazing pictures. I love the middle one with the huge cat eyes.